Modern production management also means an accurate management of the waste flow in your company. Monitoring waste flow is nowadays possible with mobile weighing systems and data handling hardware like terminals and WLAN systems. Systems: Bakkavor purchased two JCB Teletruk forklifts equipped with BRUSS weighing systems. Bakkavor is specialised in making and developing private label prepared foods for the top global grocery retailers and well-known international foodservice operators. 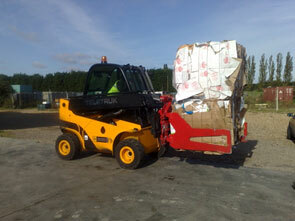 For their waste management targets, Bakkavor purchased two JCB Teletruk forklifts equipped with BRUSS weighing systems. The key advantage is that there is no loss of time involved, the operator lifts and weighs the waste products in one action. The only extra handling is the selection of the pickup location from a pre-defined scroll list. All data is stored in an on-board terminal and when the Teletruk is within reach of the WLAN router, a connection is made to the supervisors PC and the data is transferred to a dedicated file on a server from the customer. This data can be transferred to a spread sheet program or automatically transferred to the customers ERP system for further processing of the data. BRUSS manufactures and distributes weighing systems integrated in hand pallet trucks, warehouse trucks and forklift trucks. These mobile weighing systems enable companies to make their internal logistics cheaper and more efficient, to raise the quality of their products and services and thus increase client satisfaction.